The decision to name his cafe 'Espression8' came about because owner, Mr Yap thought of the word 'Espresso' for coffee together with the shoplot no. of '8' and hence, 'Espression8' meant the expression of espresso for his newly open cafe. As I step into this spacious and cozy-looking cafe, I can't help but noticed this attention-grabbing, nice big print poster right at the coffee counter. Coffee cup shape poster was display promptly looking cool with vivid image and various names for types of coffees served in cafe. This two-month-old cafe promises patrons nothing but great coffee, good food and nice ambience to dine and relax in a casual and comfortable environment. 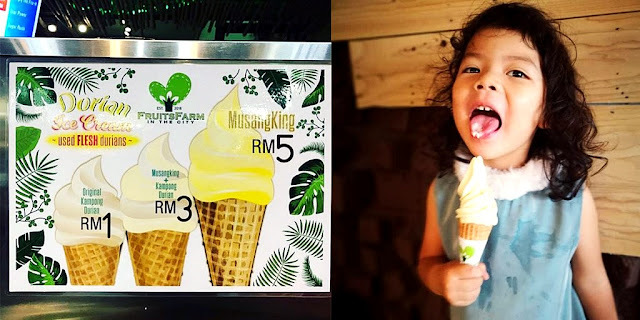 Located near to the Sunway University and fast becoming a popular hang-out place for the Sunway's students to eat and study there for the whole day! Espression8 is minimally furnished with naturalistic woody decor for tables and chairs and bare cement for the bar counter and flooring. Fashioned with naked light bulbs, everything was of a minimalist design. Espression8, signature drink called S'Mocha is one of the most photogenic drink I had ever seen. Picture worthy and probably the most instagramable drink, it is a freshly brewed cup of coffee with a shot of chocolate, topped with cute little marshmallows, crunchy crumbs and drizzle with chocolate syrup. Great tasting, fragrant with coffee and chocolate two-in-one drink, it's a Must-Try at the cafe. Before try this awesome signature drink, check out their drool-worthy video on the making of the S'Mocha right here! Espression8 ~ BerryGrey is a concoction of Earl Grey tea whirled with fresh strawberries turns into a healthy ice shake. You can feel goodness and refreshing flavour when drinking it. Good choice of drink for me. If you must choose a light meal to go with your coffee, I would recommend the Blueberry Pancake. It looked simple but was very flavourful. Fluffy and soft, these pancake melted in the mouth. Not too overly sweet and just nice with the chocolate sauce and maple syrup. Loved the little fresh blueberries that goes pop in your mouth too! Next was Chicken Wrap Benedict paired with tempting egg yolks and salad. Good combination of serving wraps with creamy poached egg. Sometimes wraps can be quite dry eaten on its own, so this is a good choice as you can dip your wrap into the egg yolk before biting into it. Seafood lovers will love this dish for it contains prawns, squid and blue mussels. Cooked in heavy cream with generous sprinkling of chilli flakes, I found the pasta dish too spicy and heavy on the cream. The pasta was heavily coated with white sauce and was kind of dry too, wished the chef had put in more sauce instead to balance off the dryness. Meanwhile if the pasta and brunch not your cup pf tea, you can opt for their reasonably priced chicken chop. Comes served with fries, garden salad with brown sauce. Although the serving portion was good but it was not well-marinated and was lacking in taste and flavour. To compensate for bland taste, you should eat it together with the brown sauce. Really enjoyed drinking this pumpkin based soup. It was neither too creamy nor rich, making it easy to drink. Flavoursome yellow-coloured soup is made from pumpkin butternut, it had a mild but sweet taste to it. The texture of the creaminess was just nice for either dipping with bread or to just drinking as it is. Overall, Espression8 is a nice and quiet place to chill and hang out with your friends over coffee and cakes. Menu choices are aplenty with some hits and misses in the dishes, still have room for improvement. So if you're around the area, do drop by to check out their signature drink ~ S'Mocha any time of the day! With the upcoming Marvel movie's ~ Avengers: Age of Ultron, movie fans must visit this iconic and attention grabbing little eatery called Slurp Cafe. 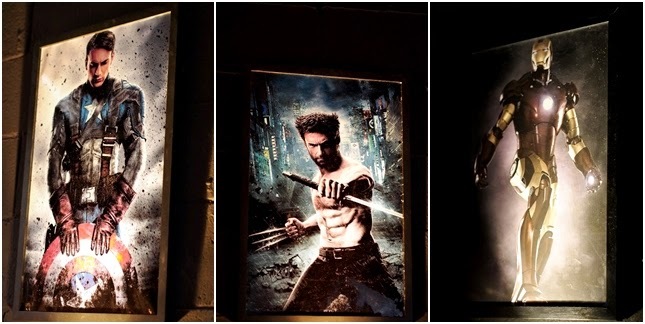 Captain America, Thor, The Incredible Hulk and Iron Man will be 'present' in mural and figurines to greet all patrons as they team up to defend the world against a mighty villain in the movie. 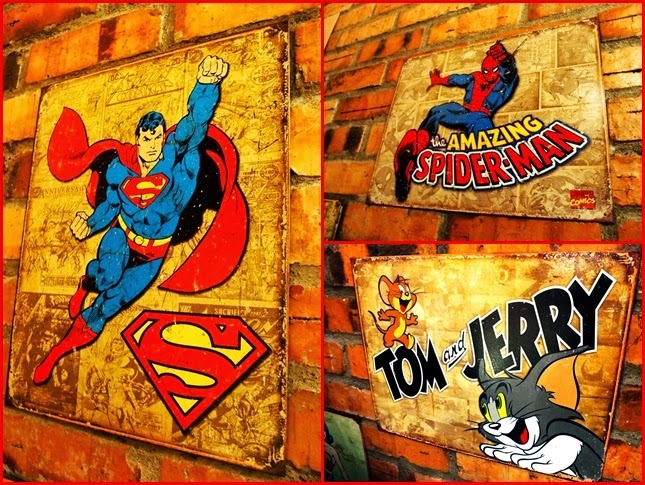 Slurp Cafe located at 3 Two Square Petaling Jaya is drawing in the attention from many Marvel Superheros, Japanese anime and cartoons characters with its attractive and interesting decor of the cafe. 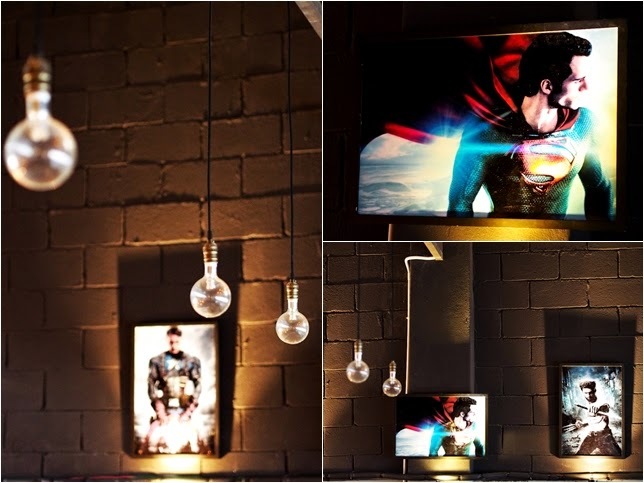 Stepping into the cafe transcends you back to your childhood days growing up with the Marvel Superhero characters of The Incredible Hulk, Spiderman, Superman and even one Son Goku from Dragon Ball Z. 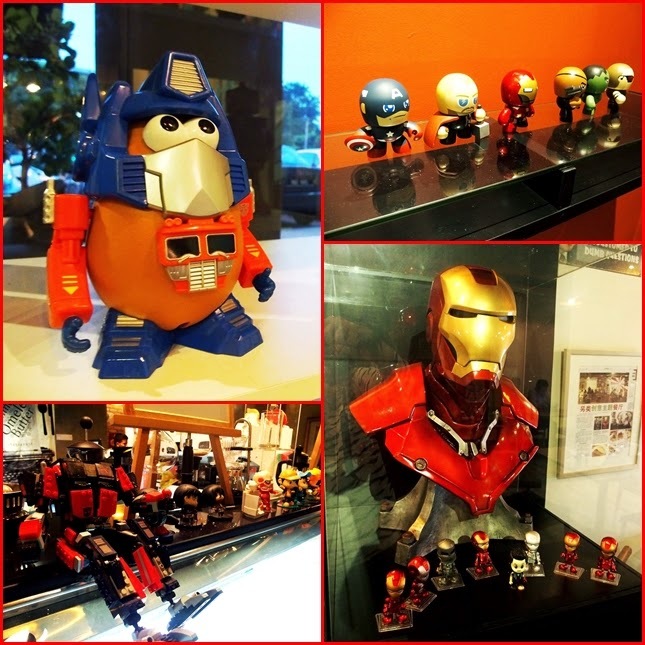 Diners or rather fans will have an interesting dining experience browsing through the extensive and beautiful collections of super hero figurines, anime figurines, Gundam car models and even a life-size Iron Man mask on display at Slurp Cafe. Don't forget to look out for the delightfully cute collection of Doraemon at the bar counter too! This concept cafe serves Japanese Fusion food with a touch of the local savour to tempt your palate. Slurp Cafe has an array of mouthwatering selections with a twist in their menu by fusion of the East-meets-West concept. Whet your appetites with Slurp Cafe's signature Omurice, Ramen Burger to Maggie Murtabak Burger, Sambal Pasta among others. But do note that they does not serve pork or alcohol on it menu. Let me start off with the desserts in this blog post as I think Slurp Cafe's desserts are simply great and certainly deserve special mentioned here. These 2 new desserts are new and are soon-to-be introduced in their menu food items in the coming future. Slurp's new creations plays around with a mix of fresh fruits, sorbet, yoghurt and ice cream. Dessert lovers can order either Mango Blast or Strawberry Fountain for an epic ending to a memorable dining experience at Slurp Cafe. Okonomiyaki is basically a Japanese pancake made of flour and egg batter mixed with shredded cabbage, onion, eggs and a variety of ingredients. Slurp Cafe's version of seafood pancake or Okonomiyaki was filled with squid, prawn, scallop and some tasty bacon too. Drizzle with okonomi sauce, Japanese mayo, aonori (seaweed flakes) and katsuobushi (bonito flakes), it was a perfectly appetizing "Japanese Pizza" to the local folks. Next is the Salad dish with grilled chicken chop. Given a great name such as 'The Best Chicken Salad Ever' befitting the dish, it comes with everything a fresh salad should have such as chock-full of green leaf lettuce. carrots strips, yellow capsicum. hard boiled egg with udon noodles and served with Asian dressing, a blended of roasted sesame dressing. Topped with healthy grill breast-meat, this makes a great tummy filling salad. Slurp Cafe's Signature dish, Japanese Omurice is a popular dish, both interesting and delicious to eat. With a base of fried squid ink rice, the dish is topped a blanket of fluffy egg omelette and drizzled with savoury sauce. Egg-lovers will definitely rejoice over the sight of this open-up fluffy omelette. Drooling over creamy with still moist texture on the inside and soft smooth almost silken-like surface on the outside. Diners can opt to have add-ons of grilled seafood, pan fried fish, fried chicken chop, fried mushroom, Hamburg steak and korokke to pair with this omurice. But for me, the egg omelette is just as good with the rice alone. Perfect match for a hearty and satisfying meal. Drawing inspiration from Malaysian flavours, their chef created Sambal Pasta by fusing the rich flavours associated with Western food with spiciness of Asian dishes. This Italian-Malaysian inspired dish has pasta stir-fried in sambal sauce accompanied with usual nasi lemak sides of crispy ikan bilis (anchovies), hard boiled egg, peanuts, cockles, curry prawns, papadum, cucumber slices and tasty pan-fried chicken. Maggi Murtabak is a burger dish given a twist using Maggi instant noodles as substitute for the burger's buns. Sandwiched between the two 'maggi bun' is chicken patty topped with sunny side up egg and served with sides of potato wedges and salad. Sorry to say I'm not a fan of maggi noodles cooked and served in this way, but it's definitely add a new twist to the regular burger we usually eat. Well, if you are adventurous in taste and don't mind forking out RM 24 for a new fusion dish, it might be worth the experience of eating this 'Maggi Murtabak Burger'. 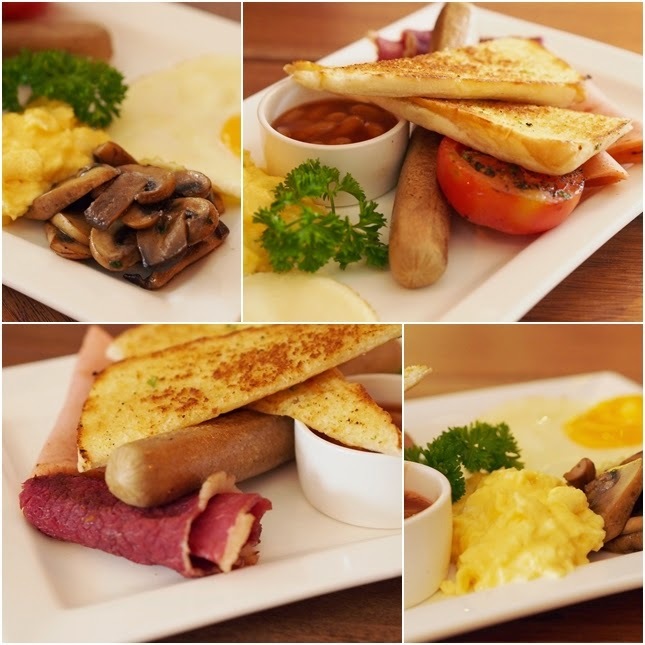 CLICK on this Link ~ www.foodadvisor.my/slurp-cafe-review and Flash it to receive a 20% Discount on OMURICE !